We just had the tiles set yesterday!! The bathtub got larger than we had anticipated, so taking the pictures of the mural are difficult. But they really look great and I am well satisified. Attached are pictures, but as I said, the pictures do not do the tiles justice. Thanks again!! So now the building is ready and we work with the final interior before opening the store.You see on the images how we applied your tiles. It’s very nice! Received boards today, they are beautiful, thank you so much, I will recommend you to all my friends!!!!! Thanks for the cutting board. It is certainly a quality product! Custom cutting board arrived this morning. Many thanks! It’s excellent! What a great product! I am very pleased and I know my wife will be when she gets to see it at Christmas. We ordered our "Cantina" Jack Sorenson mural from your booth during Gold Rush Days 2008. It didn’t take any time at all and it was ready to pick up. We so enjoyed our visit with Tammie Riggs at the TXLC Studio and installation instructions were welcomed. We did it! The custom tiles you made of the trucks are fabulous!! Thank you so much!! They look perfect on my office desk. I’m excited to know of this product and who to go to now!! Thank you again! I would like to say a few words about TXLC Custom Tile Murals. I have found a really wonderful and fun company to work with. I ordered custom-made glass cutting boards and found everyone at TXLC to be friendly, helpful and very professional. We emailed back and forth to each other a couple of times with copies, proofs and ideas on my sketch for the boards and within days my boards where completed and ready to be mailed to me. My friends that I gave the cutting boards to were really thrilled and delighted with their gifts. Thank you TXLC Custom Tiles! We ordered a western tile mural for the backsplash in our master bath. It was shipped promptly and was even more beautiful than we had expected. The tile was easy to install and looks great. We have had lots of comments and will send people your way! Thanks for all your help in our remodel project! We have ordered a couple of your products and have been very pleased with the results. 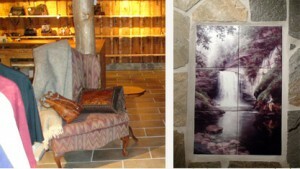 Our custom order tile is awesome and we are making western tables with the artist designed pictures in tile. Thanks so much.